On Monday, July 9th, the Brazilian Commission on Drugs and Democracy (CBDD) and Viva Rio launched a national campaign to change the law on drugs in Brazil. Public support for the campaign, Drug Law: It’s Time to Change, has exceeded expectations. While the organizers hoped to collect 50,000 signatures in the first 30 days of the campaign, that number was reached in just three days. 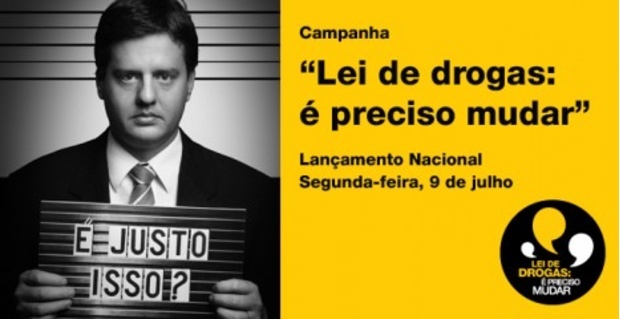 The campaign hopes to reform law 11.343/2006 by collecting one million signatures calling for Brazil’s National Congress to support more effective and equitable drug legislation in the country. While the existing law technically allows for a partial decriminalization of possession for personal use, the law does not make a clear distinction between people who use drugs and people with intent to distribute. This gap is resulting in the arrest of thousands of drug users that are trialed as drug traffickers. Since its implementation in 2006, the number of people imprisoned for carrying drugs has doubled, rising from around 60,000 to 120,000. Many of these prisoners have never committed any other major crimes, have no ties to organized crime and were only carrying small quantities of drugs when arrested. With campaign signatures now skyrocketing with over 80,000 Brazilian and international supporters, CBDD and Viva Rio have decided to present the bill to the to the president of Brazil’s National Congress this August. Simultaneous to its official presentation, the bill will also be uploaded on the online public debate forum, e-democracy. Through this mean, citizens around the country will be able to engage in the transparent process of discussing the proposed bill and sharing their suggestions for change. Some of the proposals that will be presented in the new bill include moving the issue of drugs from the realm of public security to that of health and social assistance; decriminalizing drug use and establishing clear differences between people who use drugs and dealers. The bill should also ensure quality treatment for people who use drugs, as well as support for networks and families. We believe that all of these measures will bring justice to the thousands of drug users who have been subject to draconian punishments and have been deprived of support systems in which they can find help without having to fear years behind bars. To sign a petition today, go online at http://www.eprecisomudar.com.br/. Make your voice heard! It’s time to change!